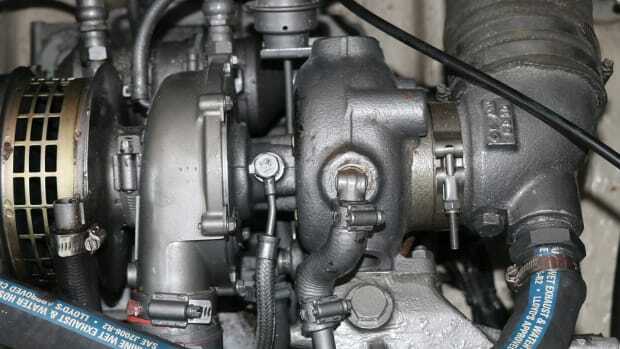 All diesels need TLC, but pod systems need a bit more. 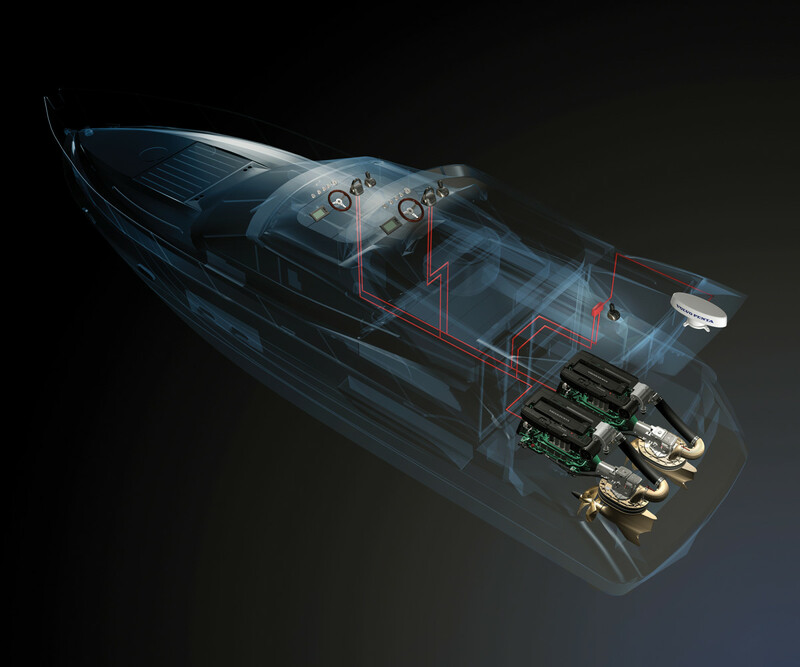 In the past decade, high-tech pod drives have changed the face of powerboating, and for the better. Controlled at low speeds by a joystick rather than wheel, shifts, and throttles, pods take most of the angst, the apprehension, and, sometimes, the sheer terror out of close-quarters maneuvering. (Have they also reduced the docking-related divorce rate among powerboating couples? Maybe.) Pods run quieter, cleaner, and more efficiently than traditional props. The downside is pod drives are way more complex than conventional propulsion systems; consequently, pod-powered boats cost more to buy and maintain. But how much more, and how complex is pod maintenance? And once the numbers are crunched, are pods worth it? Let’s have a look. 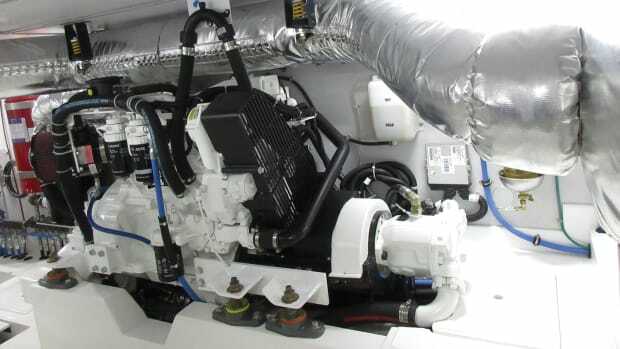 Volvo Penta officially introduced IPS (Inboard Performance System) pod drives at the 2005 Miami Boat Show; Cummins and ZF Marine followed, one and four years later, with their own versions. For the first few years pods appeared mostly on company demo boats tested by magazine writers, and received lots of press coverage, most of it extolling their handling advantages. But not many boat owners ponied up the cash to switch to pods. Then forward-thinking builders (Tiara, Cruisers, Regal, and Sabre among them) redesigned their boats for pod power and the technology became mainstream. Today, pod-powered boats are common in any yacht yard, and qualified service and repair technicians are easy to find along the waterfront. Ten years ago, many old-timers predicted that complex pod systems, with their computer-managed guidance, fly-by-wire controls, and inaccessible drive units tucked under the hull, would need constant repair and maintenance. And hitting something hard at speed would strip the pods off the bottom as neat as you please. Okay, the last bit is true—as if running over a submerged jetty or grounding hard on a shell bank wouldn’t damage conventional props. (And when the struts rip out, they can take parts of the hull with them, something that probably won’t happen with pods.) But the rest? Not so. 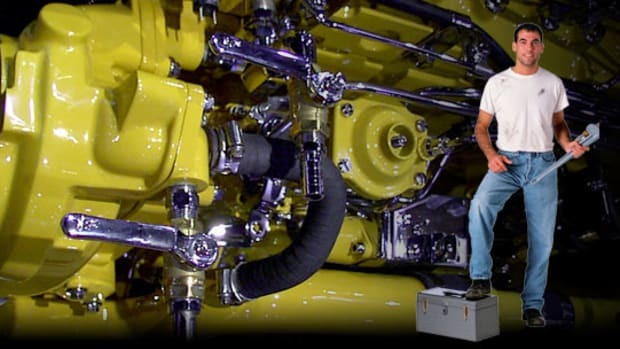 Pods from all manufacturers have proven reliable and trouble-free, when maintained correctly. Petzold said the most common problem he sees with pods is owners not maintaining the corrosion protection. 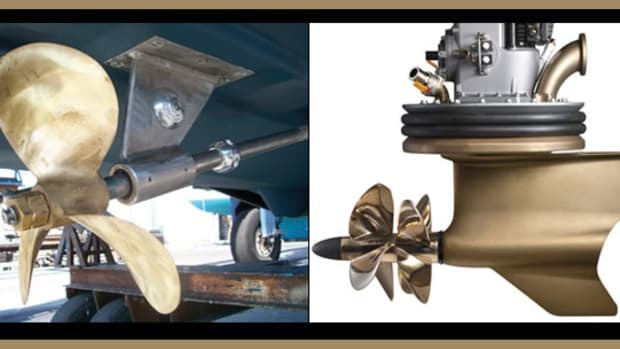 Although pod housings are built of corrosion-resistant bronze rather than the aluminum alloy used for stern drives, it’s still critical to maintain the anodes. Check them just like you check zincs on a shaft, Petzold said: Swim down and have a look. (Depending on the pod, there might be internal anodes, too. Read the owner’s manual.) Plan on replacing the anodes at least annually, using the correct alloy: Most pods use aluminum anodes, not zinc. “Don’t cheap out on anodes,” Petzold advised. Whether you have pods or conventional props, if your anodes have short life spans, have a pro check for stray current, problems with the marina’s shore power, etc. Corrosion can cause expensive damage, and quickly, too. The aft placement of pods has added to usable space on board. Most pods require service after a short break-in period at 25 hours or so. That means a haulout to remove the break-in lube and replace it with the normal lubricant. Make sure to do this, and if buying a used boat, make certain the first owner did it, too. Running the boat for too long on break-in oil can shorten the life of the pod’s innards. Ask to see the service records for the boat’s first year. Petzold pulls the props annually to grease the shafts, and to remove any fishing line or other foreign matter on the shaft or wedged into the seal. Over time, fishing line will damage the seal, and it can score the shaft, too. (Do the same with outboards and stern drives.) Once he’s inspected everything and put it all back together, Petzold paints the pod. 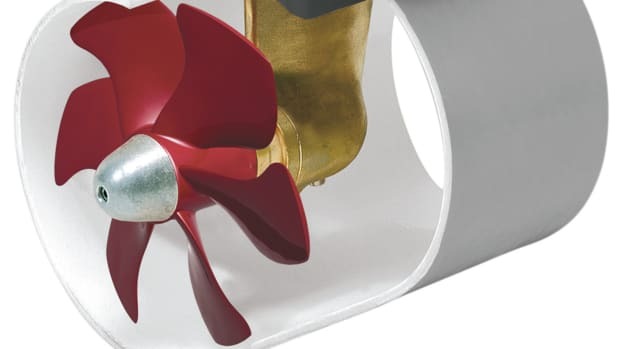 “It’s important to maintain good antifouling.” Pods have water intakes, exhausts and other places that are inviting to marine critters, and keeping them out is important. 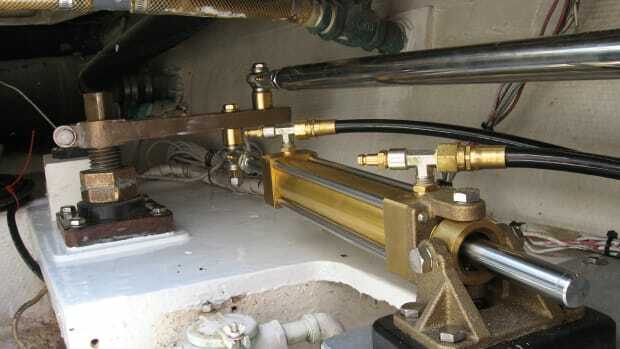 Petzold uses Propspeed, or some other antifouling paint formulated for underwater metals. 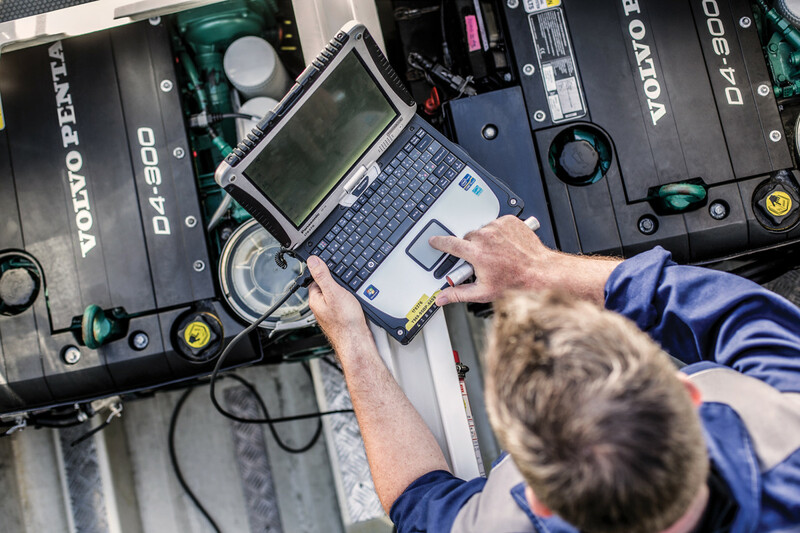 Sophisticated diagnostics go with every engine now. I’ll bet everyone who’s read this far is asking, “How much does all this cost?” Maintaining pods is a lot more involved than maintaining conventional running gear, and therefore more expensive. What does a shaft-type propulsion system really need? Zincs every year, costing a few bucks, a new Cutless bearing every once in a while, and a couple of brushfuls of paint for the struts and rudders. Pods, on the other hand, need annual TLC, and this means skilled work. Estimating the yearly cost isn’t easy either, since yard rates vary and some pods need more upkeep than others. Also, you don’t know how often the shaft seals will need replacement. For a ballpark number, I’m deferring to a well-researched article written by our late friend, Capt. Richard Thiel, in February 2014. Richard estimated an average annual cost of about $2,500 for scheduled maintenance on twin pod drives. Petzold said he thought that was about right, even almost four years later. I’m a pessimist, however, and because of this I’d budget $3,000, quite an upcharge from just replacing zincs. But who cares, really? What’s another three grand, compared to the cost of a boat big enough and upscale enough for pod drives? A couple of tanks of fuel? 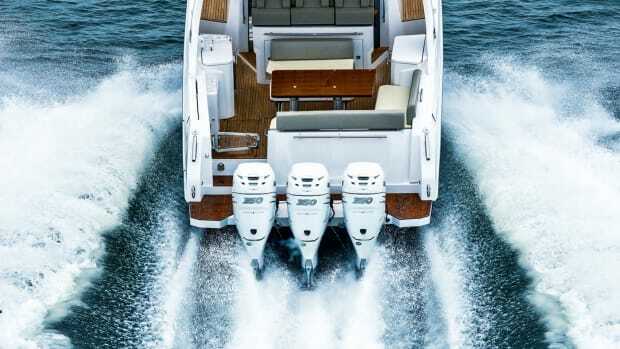 Sea Ray sells the 460 Sundancer with twin 550-horsepower Cummins diesels, with either V-drive or Zeus drives; the Zeus option adds $113,333 to the $1,004,768 price, according to Sea Ray. How many buyers do you think reconsider upgrading to pods because of the extra maintenance cost? I’d guess none. Indeed, we’re approaching “if you have to ask” territory here, and although a magazine writer like myself has about as much chance of buying a pod-driven anything as he does scoring a date with Sofia Vergara, I still think the benefits of pods far outweigh the extra initial and maintenance costs. If I could afford ’em, I’d get ’em. We only go around once anyway, so pay the money, grab the joystick, and have some angst-free enjoyment. It might save the cost of a divorce on cruelty-while-docking grounds, too, a way bigger budget-breaker than pod drives. 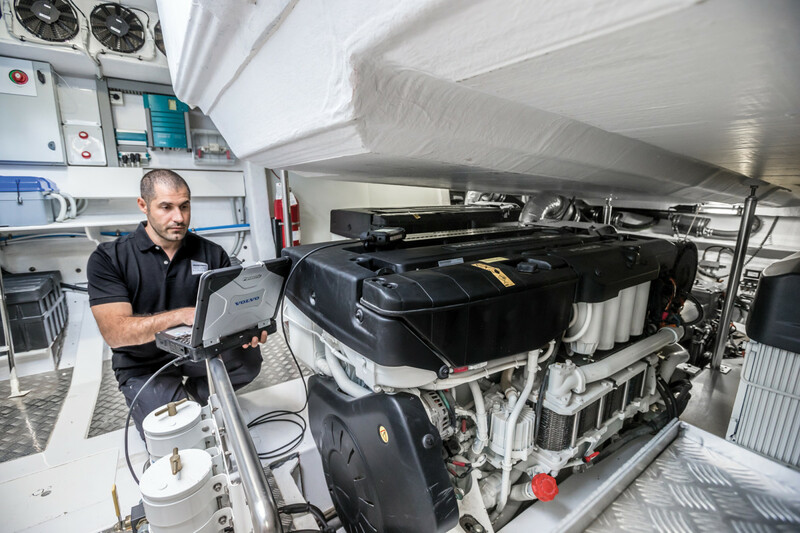 Pod performance has inspired outboard and stern-drive builders to develop similar control systems that can be retrofitted to existing boats, something not practical with pods. 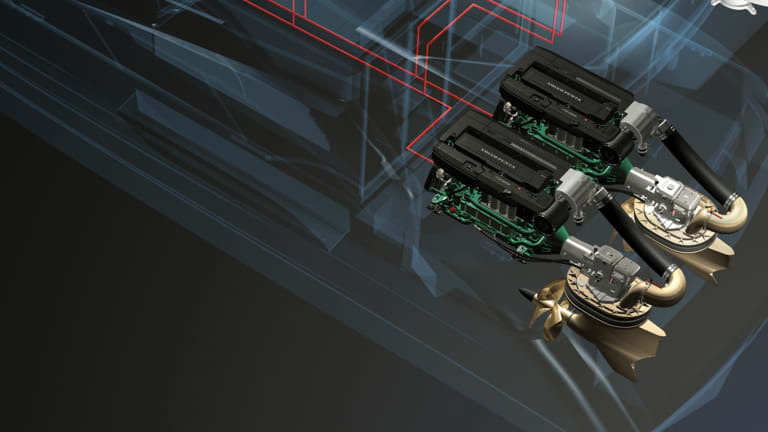 And there are computer-controlled, straight-shaft systems that can juggle shifts, throttles, and a thruster or thrusters with a joystick, too, using traditional split-shift techniques. It’s a whole new world of boathandling out there, one all of us can enjoy. Outboards are, in my opinion, the most interesting. It wasn’t so long ago that a pair of 250-horsepower outboards was as much power as any non-raceboater could hang on the stern. Today, 250s are middle of the road: Triple and quad 300s are common, and 400s built for everyday use are available, too. Heck, Mercury’s Verado 400R comes with a two-year warranty, even though it’s got “Racing” painted on the cowl. A racing motor with a warranty? And joystick piloting? What’s going on here? 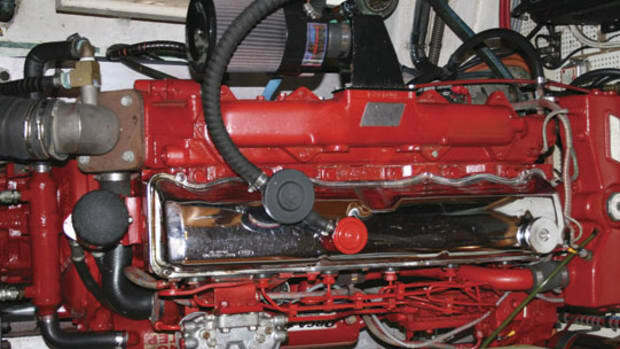 If that ain’t enough, Seven Marine builds a 557- or 627-horsepower small-block V-8 configured as an outboard motor. Joystick control? Goes without saying: It’s got ZF Smart Command 5000 drive-by-wire. Okay, the motors cost about $80,000 and $90,000, respectively. And if you have to ask about price, you really don’t need one. The bottom line is, while pods are difficult or in many cases impossible to retrofit, the boat really has to be designed for the pod from the beginning, although some V- and stern-drive boats can handle pods, too. Outboards are easy. Just add a bracket and bolt them on, install the digital controls and joystick and you’re set. You get similar handling advantages to pods, but with less maintenance—and it’s easy to find a mechanic certified on Yamaha, Evinrude, Mercury, and other brands. Only thing is, outboards burn gas, and more of it than diesels of similar power. But then outboards are more powerful and more economical than ever. If you don’t like the look of outboards, hide ’em, like Pursuit does in its SC 365i Sport Coupe, with twin outboards concealed by a transom hatch. Outboards give you the pod advantage, but without the esoteric technology. Sounds like another good option to me.